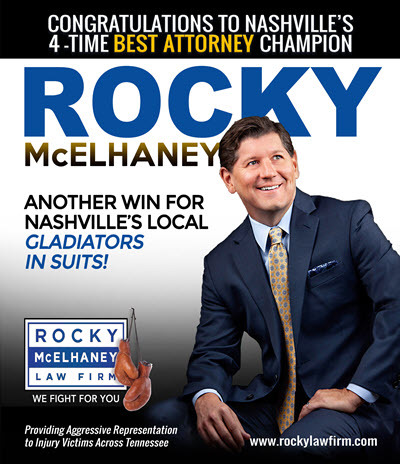 Nashville has spoken and named Rocky McElhaney “Best Attorney” in Nashville Scene’s Magazine 2018 Readers’ Poll. Nashville, TN, United States - October 19, 2018 /MarketersMedia/ — Rocky McElhaney of the Rocky McElhaney Law Firm was named the number one “Best Attorney” in Nashville by Scene magazine’s “Best of Nashville” annual Readers’ Poll for 2018. This is Rocky’s fourth consecutive year being named best lawyer. Nashville Scene runs its “Best of Nashville” issue every year, where the writers vote on who and what they think are the best people, places and things that Nashville has to offer. Scene’s “Best of Nashville” Annual Readers’ Poll asks readers to write in what they love about the city. Both sets of results are published in the issue, though neither set of results plays any role in influencing the other. Lawyers are chosen in the “Home, Goods & Services” section. Award winners are honored at the Best of Nashville Annual Party, being held at the historic Nashville War Memorial.